The black line represents the ten year average. Author: Gerard McCarthy is Senior research scientist in Physical Oceanography at National Oceanography Centre. Ivan Haigh is Lecturer in Coastal Oceanography at University of Southampton. 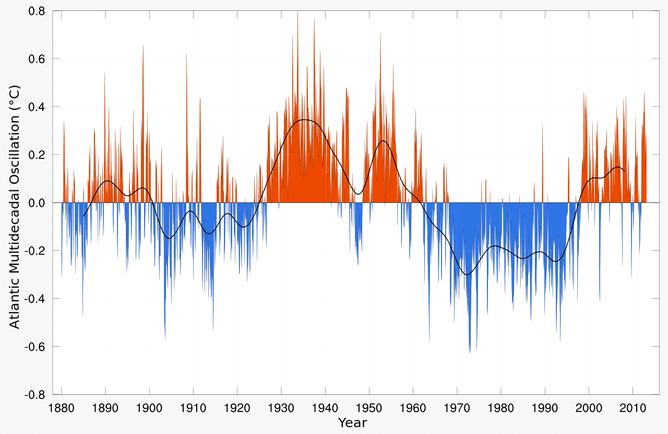 The article underplays the AMO’s effect on global temperatures, which is real and not just some regional variation. When we look at the conjoining of AMO and PDO cycles, we can see that the warm phases of both coincided with the warmth of the 1930s and 40s. Later, both AMO and PDO came together again at the bottom of their cycle in the bitter 1970s. More recently, the AMO has remained high, while prior to the current El Nino the PDO began to turn negative. This has coincided with the pause in global warming since 1998. Once this El Nino event is over, there is no reason why the PDO will not return to its natural cool state for the next couple of decades. If this coincides with a change to a cold AMO, as is likely, global temperatures will plummet. NOAA have a useful FAQ on the AMO here. It melted faster than usual this Spring. But in the last three weeks it has expanded a little in the Beaufort Sea and the Central Arctic. The actual Northern Hemisphere extent, with 4 sq km resolution, is the same as in 2012. It would be rather amazing if the present 10.8 million sq km of ice were to completely disappear over the remaining two and a half months of Summer! If it happens the warmunistas will be shouting about it. When it doesn’t happen they will be howling about some other crazy nonsense. We only have MASIE, of course, due to technical difficulties. Meanwhile, temperature anomalies in the Southern Hemisphere are plummeting – the latest ‘2-meter anomaly’ is now 0.25 C below the 1981-2010 average. But what follows is nonsense: ‘This a major influence on the wind patterns and the heat transferred between the atmosphere and ocean’. The ocean has heat capacity and it accumulates energy according to the extent of cloud cover. The atmosphere does not have a heat capacity and it functions to efficiently remove energy from the surface and deliver it to space. Where the heat manifests in terms of the surface layers of the ocean depends upon the winds.The extent of cloud cover that determines the rate of energy uptake depends upon the state of the North Atlantic Oscillation that is simply the local Atlantic manifestation of the Arctic Oscillation. The Arctic Oscillation measures the change in the relationship in atmospheric pressure between the mid and high latitudes. Since the mid 1990’s surface pressure has been increasing in high latitudes and declining in mid latitudes. This is a function of the temperature of the stratosphere and the energy sustaining the development of polar cyclones. As the stratosphere cools polar cyclone activity weakens and atmospheric pressure increases from about 50° of latitude northwards. As this happens the warm wet westerlies fall away and the cold dry easterlies begin to flow southwards. This is observed as the jet stream swinging further southward more frequently.The north Atlantic drift that depends upon the strength of the westerlies consequently weakens. Cold waters tend to stay where cold waters are normally found and warm waters stay in those zones where warm waters are normally found and the temperature gradient from equator to pole steepens. As atmospheric pressure falls in the mid latitudes the extent of cloud free sky shrinks. The rate of uptake of energy from the sun by the ocean simply falls away. The chain of causation begins in the stratosphere. Functionally, the rate of descent of mesospheric air that is ozone poor into the stratosphere modulates the partial pressure of ozone in the stratosphere. The Jet stream links and actually gives rise to a chain of polar cyclones that vary in there intensity according to density differentials driven by ozone heating of the air at and above the tropopause. To go back one more step and explain what drives the variable flow of mesospheric air into the stratosphere involves complications that are too many to deal with here. But perhaps that is confirmation bias!! A cold Atlantic also means fewer hurricanes hitting the southern US. I thought that there’s been no hurricanes in the USA for a record number of years. Does this mean that the current low hurricane count will continue at least for southern states? No Major (CAT III or higher) Atlantic hurricanes have hit the shores of the 48 contiguous states since Wilma came ashore at Cape Romano, Florida Oct 24, 2005 as a CAT III storm with 120 mph winds. And that is a record that continues but if the projections are correct there is a pretty high probability that hiatus will end this coming season. According the Weatherbell conditions have turned favorable for near in tropical storm development off both the Gulf and Eastern coasts of the US so if they have it right, then the southern gulf shore is just likely to be hit as the south eastern seaboard this season. Anyway the weather record sure indicates that colder times are stormier times. And the earth is cooling now. I had thought that the computer models only failed at their input end, where the radiant forcing functions that drive all heat input are truly radiant fiddle factors with very weak (i.e. simple grey-gas theory based) science behind them. Reading this, it is apparent that the oceanic movements and their cycles are not at all understood: I suppose that this is discounted in the same way as clouds are in the atmospheric models. It is the oceans that drive the atmosphere, so how can any model that over-simplifies this factor be credible? The Wizard of Oz was more credible than the models that underwrite global warming: at least although he was a bad wizard, he was a good man!